Σε πολύ καλή τοποθεσία της Πεκίνο, το The Pagoda Light Hostel είναι μια πολύ καλή βάση απ'όπου μπορείτε να εξερευνήσετε την σφύζουσα πόλη. Από εδώ, οι επισκέπτες μπορούν να έχουν άμεση πρόσβαση σε όλα όσα η πόλη έχει να προσφέρει. Από τη βολική της τοποθεσία, η ιδιοκτησία προσφέρει εύκολη πρόσβαση σε κορυφαίους προορισμούς της πόλης. Με τις υψηλού επιπέδου υπηρεσίες και την μεγάλη ποικιλία ανέσεων, το The Pagoda Light Hostel δεσμεύεται ότι η διαμονή σας θα είναι όσο πιο άνετη γίνεται. Κορυφαία χαρακτηριστικά του ξενοδοχείου συμπεριλαμβάνουν τα δωρεάν WiFi σε όλα τα δωμάτια, ιδιωτικό τσεκ ιν/τσεκ άουτ, παράδοση ειδών παντοπωλείου, ημερήσιος καθαρισμός, 24ωρη φύλαξη. 28 δωμάτια μοιρασμένα σε 3 ορόφους παρέχουν ένα ζεστό και ευχάριστο σπιτικό μακριά από το δικό σας. Σε επιλεγμένα δωμάτια θα βρείτε μοντέρνες ανέσεις όπως επίπεδη τηλεόραση, κρεμάστρα ρούχων, λευκά είδη, θυρίδα, καθρέφτης. Το ξενοδοχείο προσφέρει μερικές μοναδικές ευκαιρίες ψυχαγώγησης όπως οι αίθουσα παιχνιδιών. Όποιος κι αν είναι ο σκοπός της επίσκεψης σας στη Πεκίνο, το The Pagoda Light Hostel είναι μια εξαιρετική επιλογή για μια χαρούμενη και συναρπαστική απόδραση. I was travelling with my mum who is in her 60's. The room is at the second floor, but not an issue as we were traveling light. The room is clean and comfy, we had a good stay and definitely like it! The location is good, near to MRT and eateries in walking distance. Staff not so friendly but very helpful. The cons side is only the area was under construction (pedestrian walkway) during our stay, dusty walking outside and hardly travel with our luggage. But I observed their progress was quite fast and I believe once the area has done construction, it would be very nice. There will be benches and flowers around. What I like about Pagoda Hostel is because it is quite near the subway station. The staffs' English is limited but my check in and check out process was easy. Many food stalls and restaurant nearby. The hostel bed have little privacy though, I hope there is curtain or something for each bed so everyone get their own privacy. Will recommend to anyone visiting Beijing. hairdryer is only available during 8am to 11pm and only 3 female shower room for the dorms. i will choose to book a room with shower inside the room next time. It was very clean, had all the necessary amenities, but people at the reception don't speak English at all. Overall, pleasant stay! grrat staffs, location, facility, highly recommended!! I stayed at the hostel for four nights, at the end of Dec, in a double room with a friend (we are two girls). 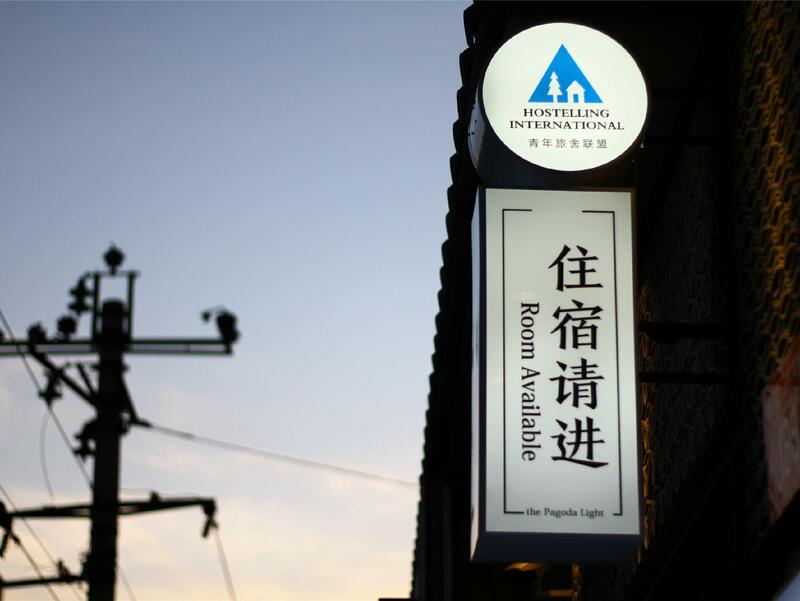 The hostel was in a walking distance from 阜成門 (Fuchengmen) and 西四 (Xisi) station, and it was clean, organized, lovely-decorated and quiet. The staff were not remarkably friendly but definitely helpful. Our room was on the second floor, where a hollow courtyard located in the center and brought in skylight from the the third floor. Each side of the courtyard was made into high table and there were bar stools prepared so it's convenient for travelers who need to do some paperwork. The key to the room was a card. In the room we have a double bed, a TV, two bedside cupboards, a single sofa, a coat hanger, two mugs, and they offered basic toiletries and bottled water. The bathroom (also toilet) and the bed area were separated by a glass, which was mostly forsted, but not the door (so you can see through it). Also, the door was just a push-and-pull glass door and cannot be locked. The floor of our room was wooden, including the bathroom. 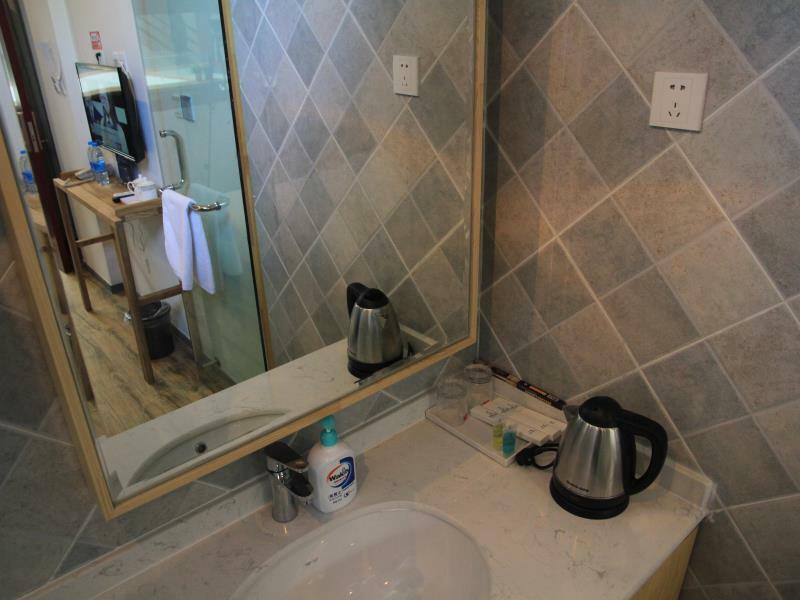 We loved it and the ceramic tiles on the wall of the bathroom. During our stay, we also loved the beautiful coffee shop+restaurant on the third floor! It opened from 10 am-9 pm. and the coffee there was amazing. In short, for us the stay was wonderful and if we are gonna visit Beijing again, we will stay there again! 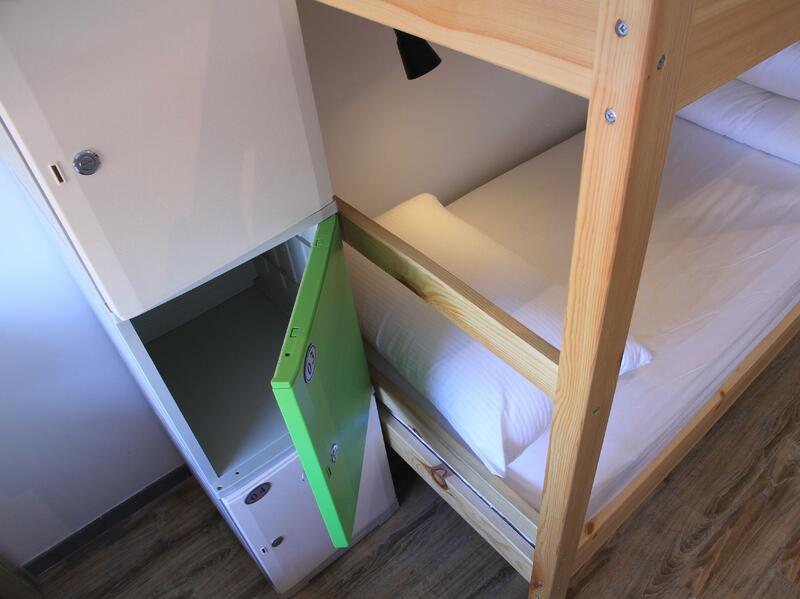 I would recommend this hostel to ladies that travel alone as it is safe and clean. The location is good and the room is nice. The staff here is very very friendly. I would say it is the best hostel in Beijing at this price. Will come back again! 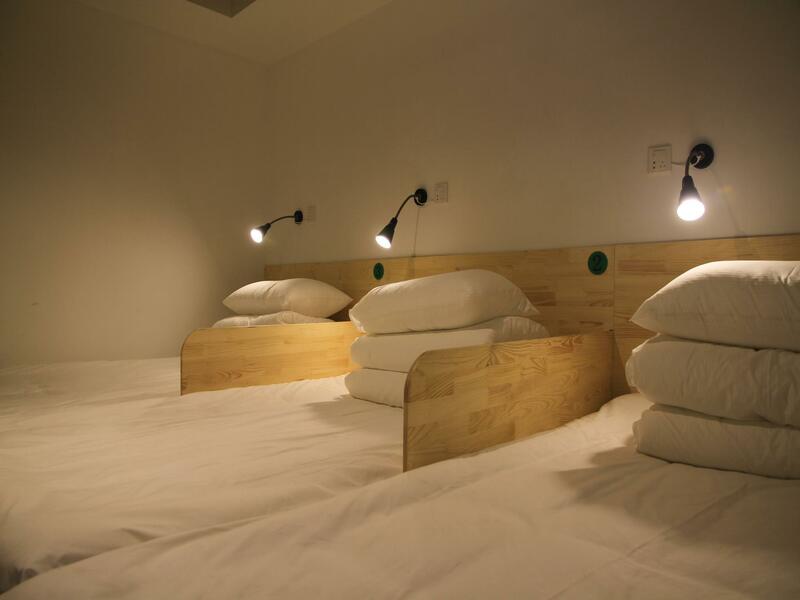 This hostel provides a grade A travel experience. There is air conditioning in every room, it is spotless, and there is good service 24/7. 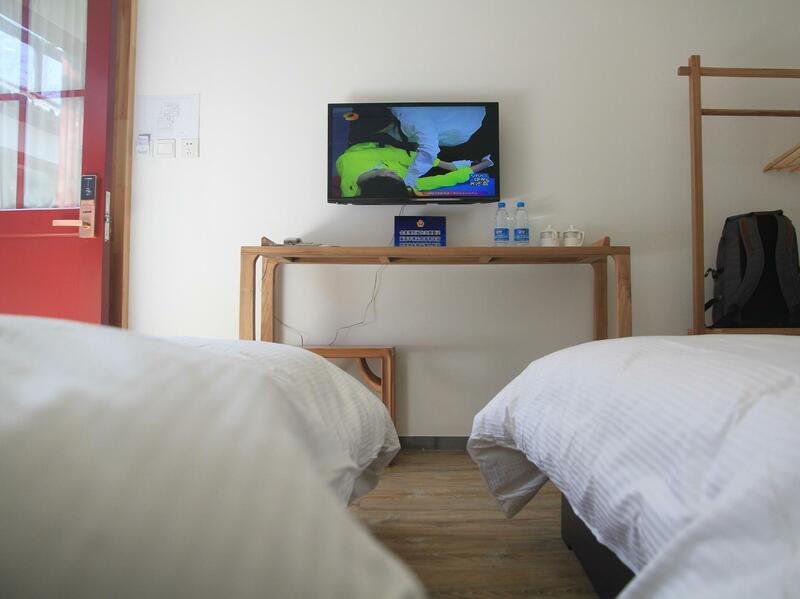 The location is great; it is very close to the Fuchengmen metro station, and three stops away from Tian'anmen Square. The staff is friendly and provides helpful suggestions for where to visit. My plans changed and they helped me plan my trip, book new trains and flights, and helped me make the most of my time in Beijing. To get to the hostel from the airport, I took the local airport bus to Xidan and then took a cab because I arrived after midnight. If you arrive during the day, the walk from Xidan is quick and easy. Enjoyed my stay at here. Σταθμός Υπόγειου Σιδηρόδρομου Fuchengmen στα 0.61 χλμ.